The first half term of the school year is often the hardest, not helped by the prospect of chilly weather and long, dark evenings. On top of that, everyone has to re-set their system after a long summer break and get used to new schedules, teachers and routines. Which is why the October half-term break is such a great time to get away and set everyone up for the hectic lead-up to Christmas. In Sicily, average temperatures are still nudging the low 20’s which means that al fresco lunches and days on the beach are still very much an option. Naturally, temperatures dip in the evening but on the upside, Sicily’s beaches and most popular tourist sites are generally crowd-free in October. There is still good availability – and plenty of offers – at several of our Sicily villas. For those lucky enough to have the luxury of a two-week holiday, some of our villa owners will consider a midweek changeover when there are further savings to be made on flights. 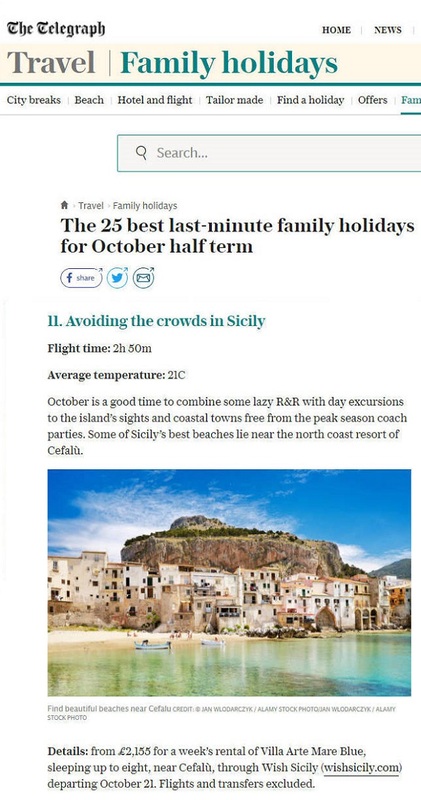 If you are looking for inspiration for October half-term, see the Telegraph’s round-up of late availability holidays which includes our Villa Arte Mare Blue, near Cefalù.